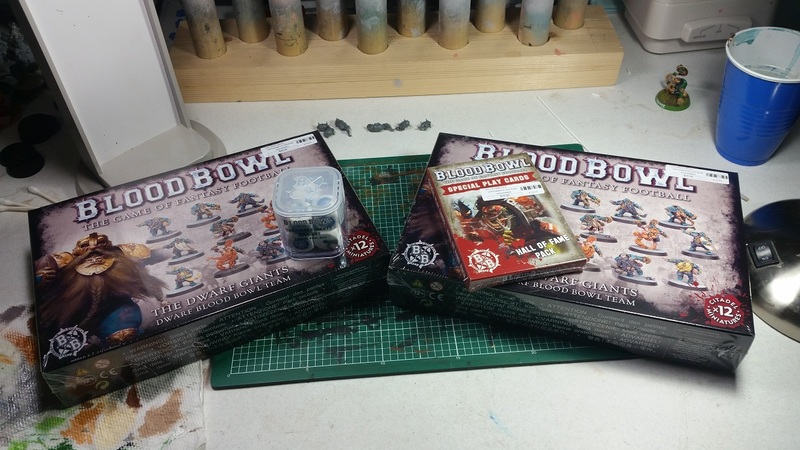 Have I Mentioned My Blood Bowl Addiction? Blood Bowl has been my favorite game (with Mordheim following as a close second) since I started playing somewhere back around ’95 or ’96. The 3rd edition Orcland Raiders boxed set were the first Games Workshop minis I ever bought. I played them exclusively for several years before I started branching out and trying other teams. I ended up with a decent collection of minis at one point, but ended up selling off everything but that first Orc team a number of years ago due to lack of time. Then, Games Workshop stopped supporting the game and all of the minis went out of print. 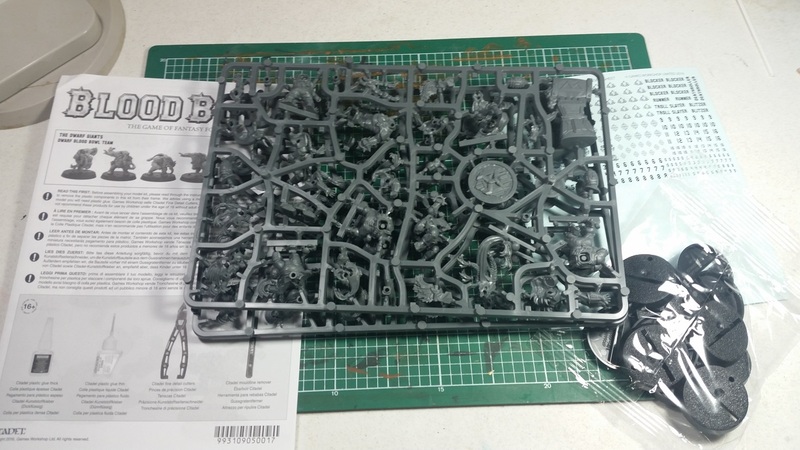 By the time I got back into the game, and gaming in general, the only way you could get the old Games Workshop minis was by paying insanely high prices on eBay. Over the last several years, I have spent a pretty ridiculous amount of money acquiring and in some cases, re-acquiring these minis that I always wanted, but did not have. As a result of how much money I have spent adding these old minis to my collection, I have decided to buy pretty much everything in the new release of the game. In the case of the teams, I am pretty much buying two copies of everything… which brings us to the point of today’s post. 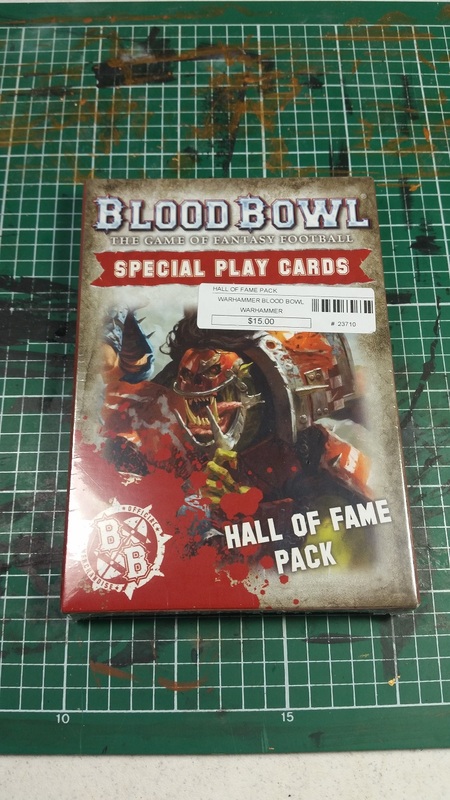 More Blood Bowl goodies! 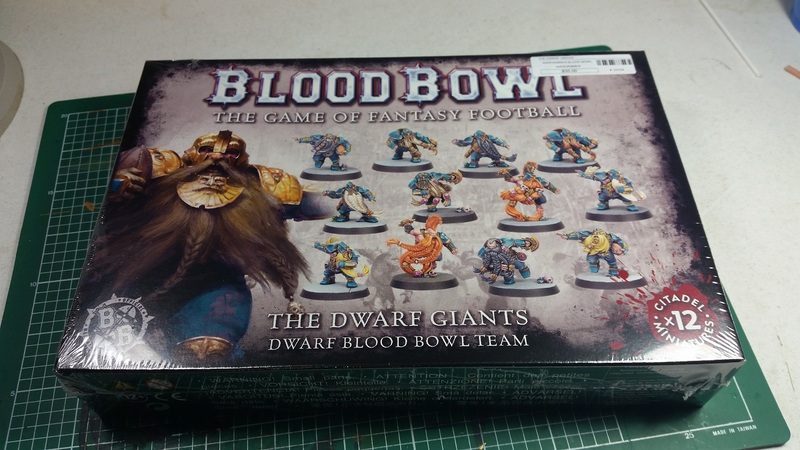 Yesterday saw the release of several new items in the Blood Bowl range, mostly centered around the new Dwarf team. There were three widely available releases and one web exclusive item. I have been pretty irritated by the number of releases that are exclusive in one way or another, but that is a topic for another post. 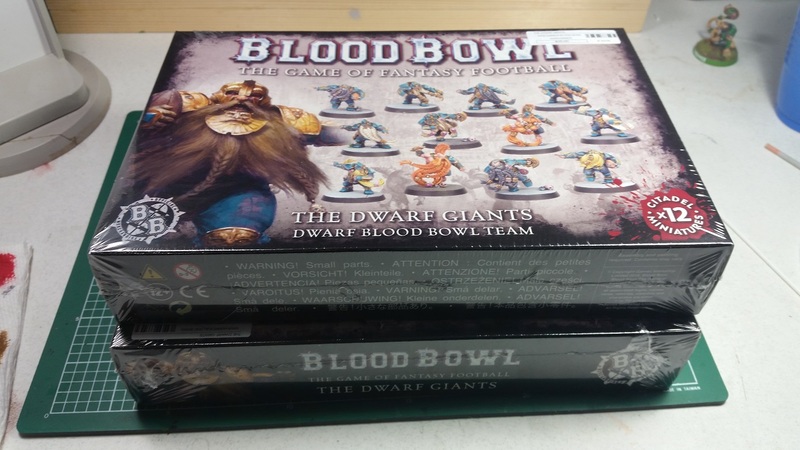 Yesterday’s release included the Dwarf team minis (which as previously stated and shown in the pic above, I bought two copies of), the Special Play Cards: Hall of Fame pack, and the instantly sold out online Dwarf Giants Dice Set. I was lucky enough to secure a set through pre-order from my FLGS. 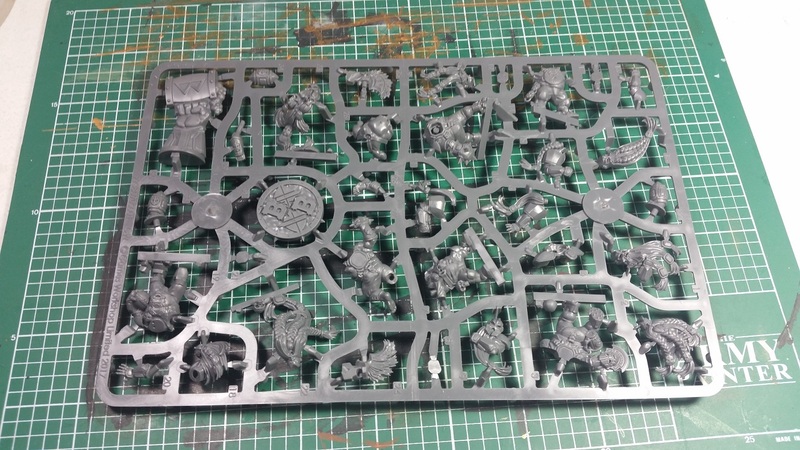 There was also the online exclusive, and also instantly sold out, Dwarf/Skaven themed pitch and dugouts. I was lucky enough to get my online pre-order in on this before they disappeared. I will write another post and show it off once it arrives. First up for a closer look is the Dwarf team itself. I bought two copies of the team… I have no self control. How about we dive into the box for a closer look at the contents? A nice group shot of everything in the box. 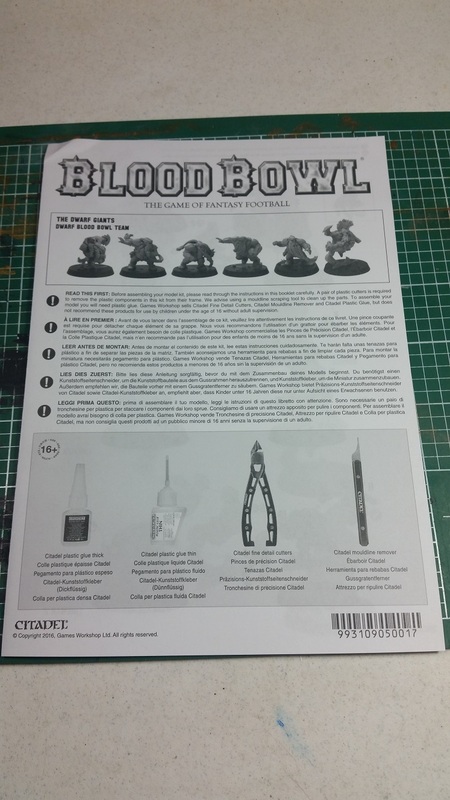 Like the Skaven team boxes, this box contains two identical sprues of minis, counters, and footballs, a bag of 32mm slotted bases, a water slide transfer sheet of numbers and other detailing decals, and a sheet with assembly instructions. One thing the Dwarf team box includes that is a first for this release is optional heads/beards for the Blitzers and Slayers. That is a welcome addition for some added flexibility in the appearance of the minis. Additional pose sculpts for the positional players would be even nicer, but I will take what I can get. You get two of these bad boys in the box. 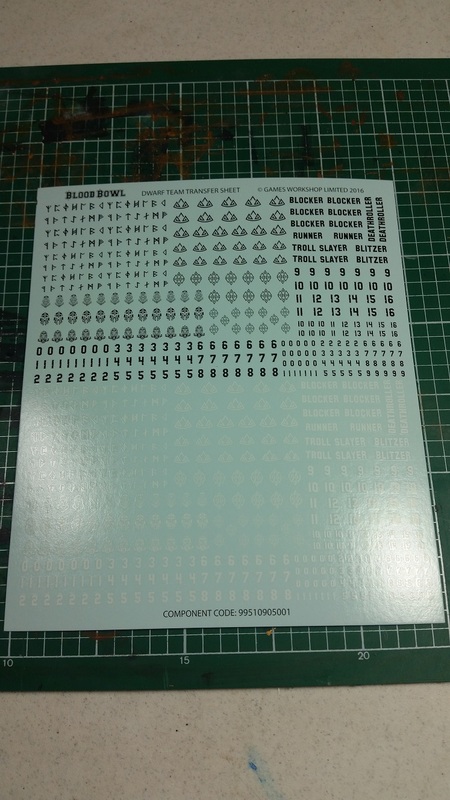 Lots of good options for graphics on the transfer sheet. 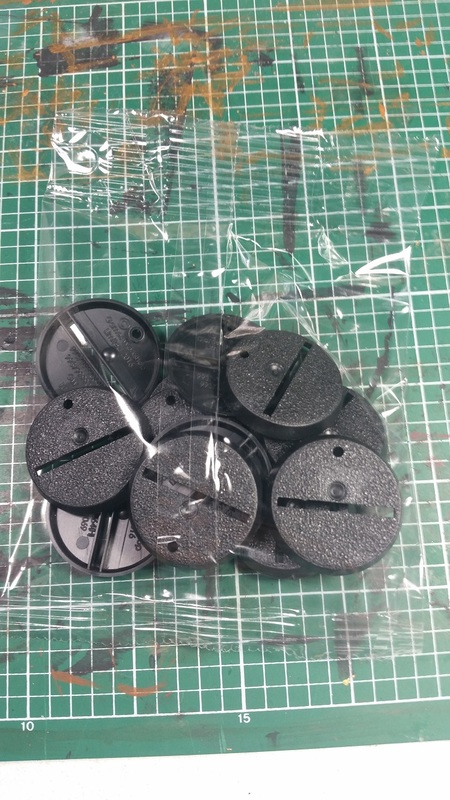 A bag of obligatory slotted bases with holes for the football pegs. You can leave the bases as is, or you can come up with other solutions if you want. I chose to put a magnet in the hole, cut off the tab from the bottom of the footballs, and then embed another magnet in the bottom of the footballs. Since I have been using magnetic footballs on my minis for a while now, I felt this was the best way to keep continuity. Front cover of the instruction pamphlet. I like that there is roster build info on the back of the pamphlet. If you buy the team box, you do not HAVE to buy the Deathzone supplement in order to know how to play the team. What about the minis themselves? Well, I have only put one together so far as I have too many minis already on the painting table that I need to finish up before diving into a whole new team. 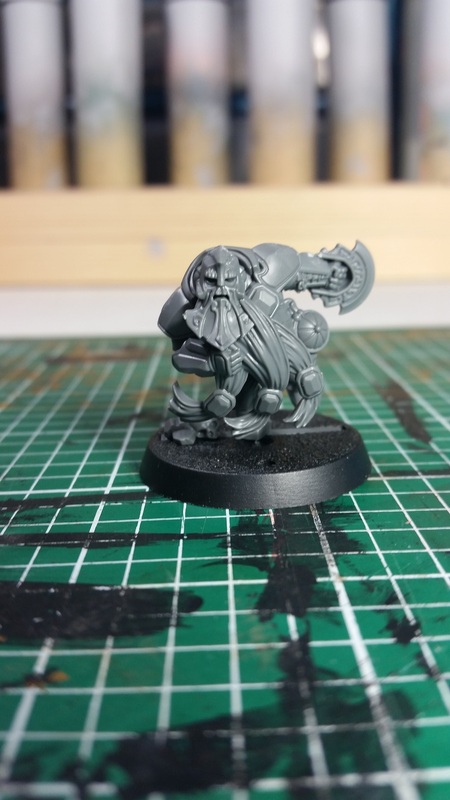 Here is the new Dwarf Blitzer mini. Decent sculpt and nice, sharp mold lines. I know a lot of people do not like the new look of the Dwarf team, but I think it fits in pretty closely with Games Workshop’s current Fantasy/AoS Dwarf minis. 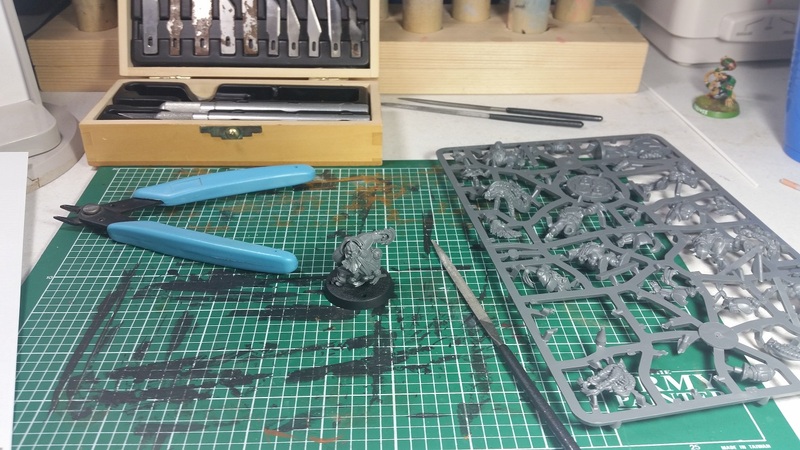 One of the main concerns of a LOT of people in regards to the new release has been about the scale of the new minis. The new Human team minis are noticeably larger than previous editions, while the new Orc team is mostly just much wider and bulkier than previous editions (with the exception of the Orc lineman who is almost as tall as the 3rd edition Black Orc mini), and finally the new Skaven team is just about the same scale as the 3rd edition Skaven minis (except for their absurdly long tails). 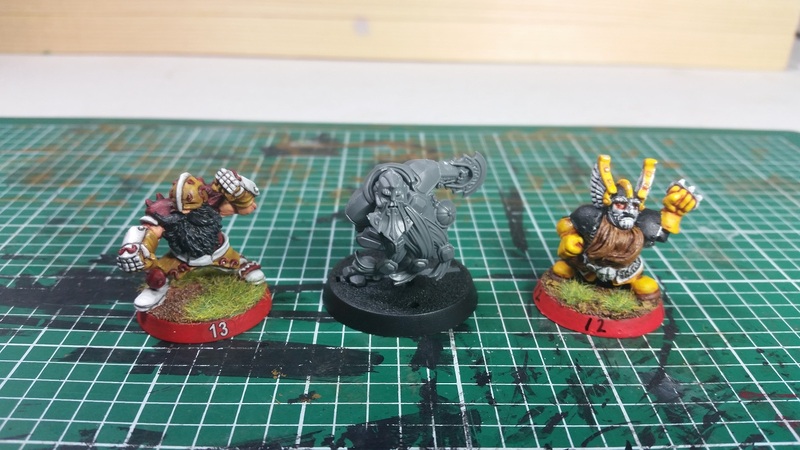 How do the new Dwarf minis measure up (see what I did there?) to the previous releases? They are actually pretty close in scale to previous minis. Here is the new Blitzer mini next to a 3rd edition Games Workshop Blitzer and a Blitzer mini from the somewhat recently released Iron Golems, Iron Forgers team. The new Blitzer mini is probably a little taller, but it is also sculpted in a more dynamic pose that could account for the small amount of additional height. All in all, they are very close in scale, and I think they are a nice evolution to the Dwarf team. In the interest of full disclosure, I could do without the leaping Troll Slayers, but that again is a topic for a different post. Up next to show off is the new set of Special Play Cards: Hall of Fame Pack. 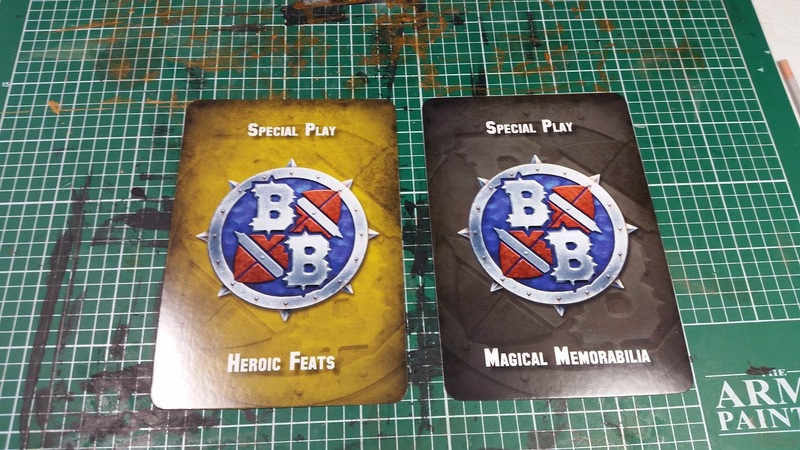 There are sixteen Heroic Feats cards and ten Magical Memorabilia cards for a total of twenty-six cards in the new deck. The Heroic Feats cards have effects ranging from granting extra MVPs to players who survive the game long enough to granting additional skills and stat increases to a player for the duration of a single turn. The Magical Memorabilia cards are like the old Magical Items cards from older editions of the game, with the twist of the items themselves being the previous property of Star Players in the game’s fluff and lore. Items like “Zug’s Jersey, 2492” given to a player on your team prevent your opponent from using ANY Armor Roll modifiers (Claw, Mighty Blow, foul assists) on said player for the rest of the game, while “Bob’s Biffin’ Helmet” grants a player +1ST and Mighty Blow for the duration of a single Block/Blitz action. Good stuff that should add some interesting and amusing elements to your games. For the record, I am not one of those players who gets super caught up in the “balance” of the game. 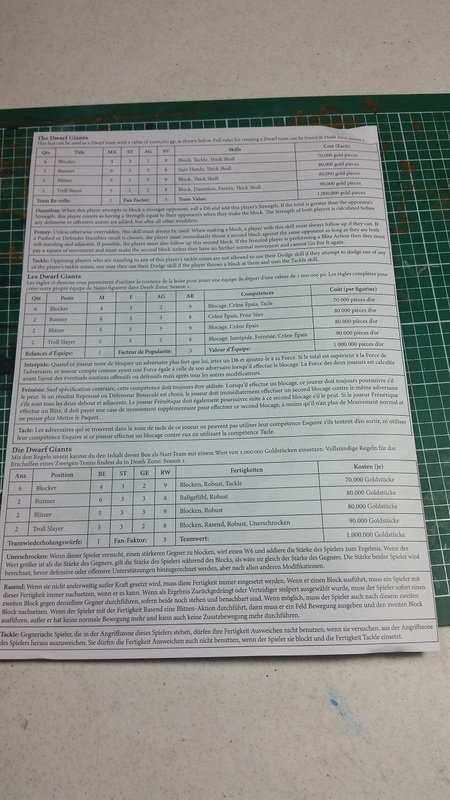 When I started playing Blood Bowl shortly after the release of 3rd edition, the Deathzone supplement added LOTS of wacky, completely “broken” elements to the game, which I loved. I think people who take Blood Bowl too seriously have really caused it to lose some of its charm over the years… but that is just my opinion. The last thing we have to look at from the new release are the fabled Dwarf dice. 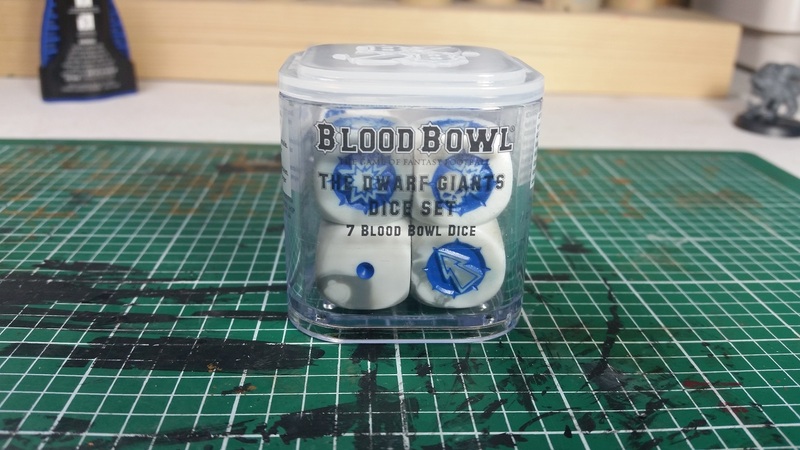 So, the talk online is that these, much like the equally hard to find Skaven dice (and the alternate game boards) are not produced in house and are ordered months and months in advance. 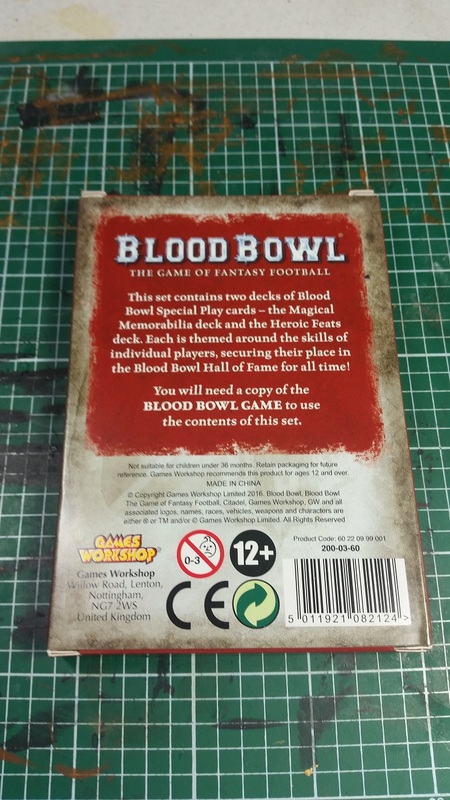 Supposedly the popularity and sales numbers of Blood Bowl have greatly exceeded Games Workshop’s expectations and they were completely taken by surprise by how well everything is selling. I maintain that if Games Workshop was surprised, then they were not paying attention, but again, I digress. My FLGS managed to get three sets of the dice for sale, and I was able to pre-order the second available set once pre-orders went live. While these are not really a “must have,” it is nice to have them in the collection. 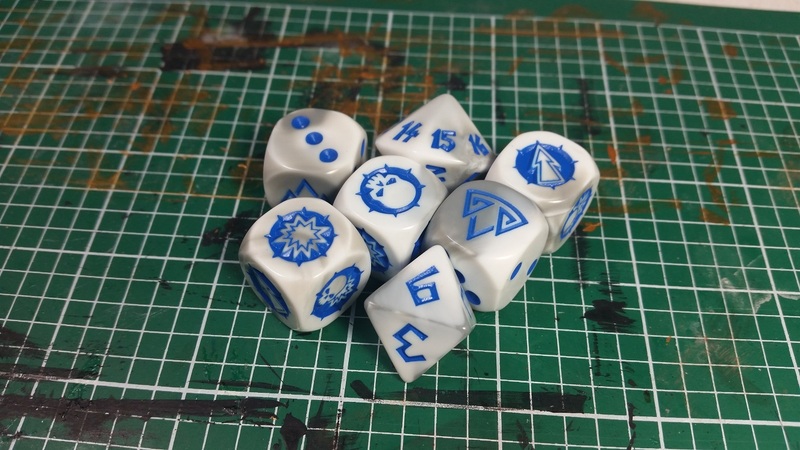 The dice are a nice white/marble set with blue pips. Like the other dice sets that have been released for the new edition of the game, there are three Block dice, two D6’s, a D8, and a D16. 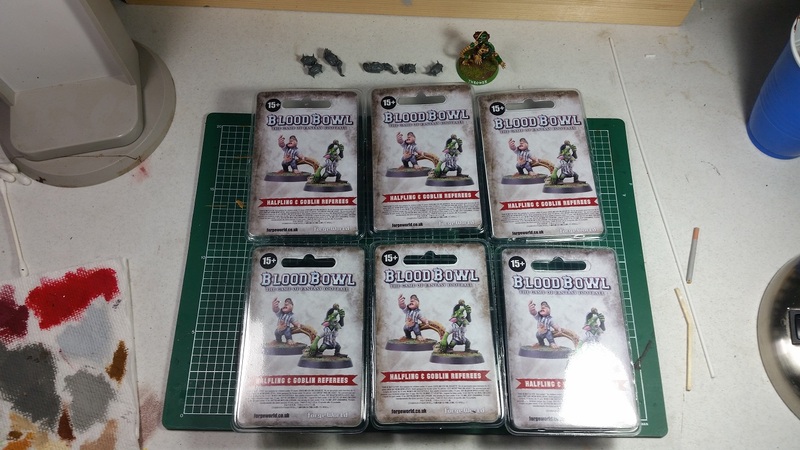 More Blood Bowl goodies for me to spend money on. I have more thing to talk about today that is not related to yesterday’s release… In my last post, I talked about the limited edition Halfling and Goblin Referees from Forge World that I had ordered. As I said, after just over a month of waiting, I contacted Forge World customer support to see about getting any tracking info, and they responded by sending me another order with upgraded shipping. About a week and a half later, I received those minis and everything was great. Then, about a week or so after that, I got another small box in the mail… The box was from the UK, and it rattled when I shook it. Could it be? I opened it up and I could not believe what I saw. After something like seven weeks in the black hole of UK to US shipping, I actually received my original order of referees. So now I have one set for my collection, one set for a friend who recently got back from Afghanistan, one set for a future ace in the hole trade, and three sets to do whatever I want with. Woohoo! 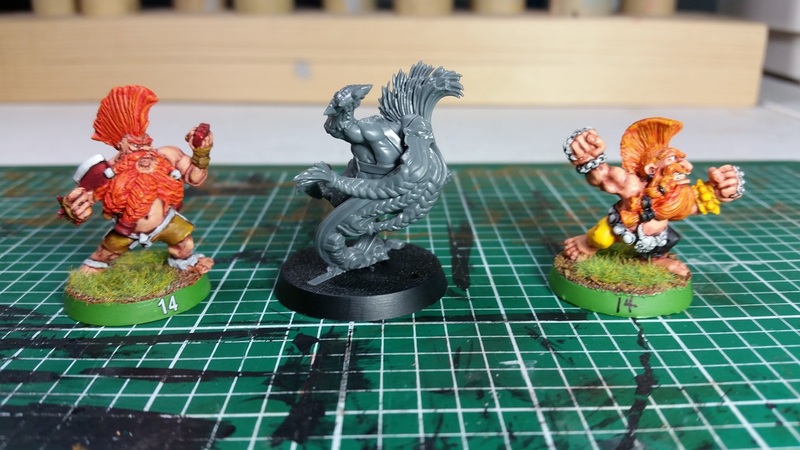 I was asked for a size comparison shot of the leaping Troll Slayers, so here we go! 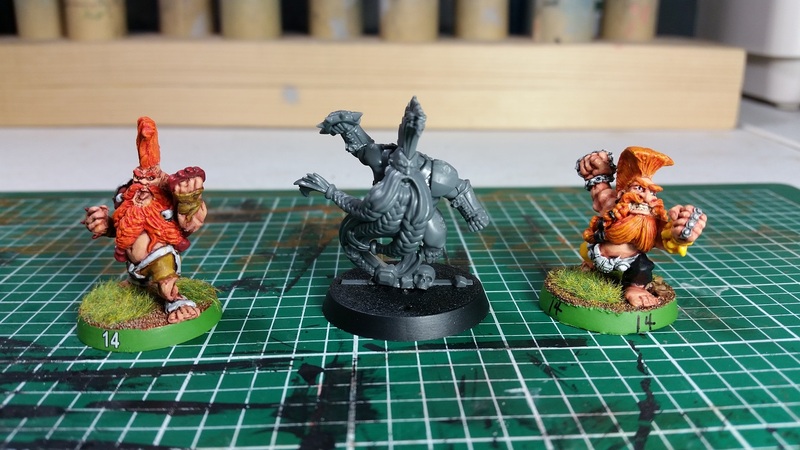 Here are two shots of the new Games Workshop Troll Slayers next to a 3rd edition Troll Slayer and another Iron Golems mini. Obviously the leaping Troll Slayer is taller, but not by as much as you would think. 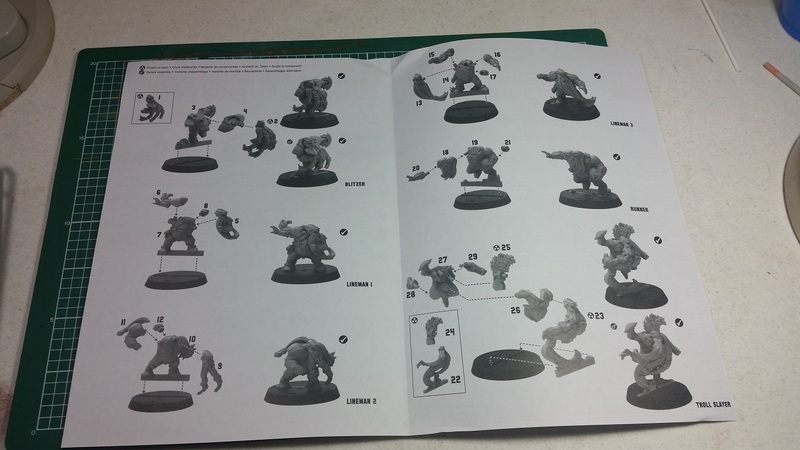 One thing I did notice was that the Troll Slayer seems to be much more realistic scale than the 3rd edition Troll Slayer. The new Slayer has a MUCH smaller head/face, though the rest of his body proportions seem to be fairly close to the 3rd edition mini. By comparison, the Iron Golems Slayer’s head appears to be between the other two in size, while his body is pretty much dead on with the new Games Workshop Slayer. Hope this helps!